The 2002 World Series was a best-of-seven playoff series to determine the champion of Major League Baseball for the 2002 season. It was the 98th series between the champions of the American League (AL) and National League (NL), here respectively the Anaheim Angels and the San Francisco Giants. 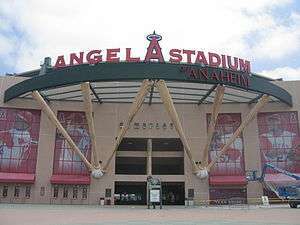 The series was played from October 19–27, 2002 at Pacific Bell Park (now AT&T Park) in San Francisco and Edison International Field of Anaheim (now Angel Stadium of Anaheim) in Anaheim. The Angels defeated the Giants by four games to three to win their first World Series championship. This was the first World Series since the 1995 inception of the wild card in Major League Baseball (and the last until 2014) in which both wild card teams would vie for the title. The Angels finished the regular season in second place in the American League West, four games behind the AL West champions Oakland Athletics. They defeated the four time defending A.L. champions New York Yankees three games to one in the best-of-five American League Division Series (ALDS), and in doing so won their first postseason series in franchise history. They then defeated the Minnesota Twins four games to one in the best-of-seven American League Championship Series (ALCS) to advance to the World Series, another first in franchise history. The Giants, meanwhile, finished the regular season in second place in the National League West, 2 1⁄2 games behind the NL West champions (and defending World Series champions) Arizona Diamondbacks. They defeated the Atlanta Braves in the National League Division Series (NLDS) and the St. Louis Cardinals in the National League Championship Series (NLCS) to advance to the World Series, giving the team their 20th NL pennant and 17th appearance in the Fall Classic but only their third since moving from New York to San Francisco in 1958. The series was the fourth World Series played between two teams from California, after 1974, 1988, and 1989. Barry Bonds, Reggie Sanders, and J. T. Snow each hit home runs to help propel the Giants to win Game one. Game two was a high-scoring affair that the Angels ultimately won on Tim Salmon's eighth-inning home run. The Angels routed the Giants in Game three, but lost Game four on a tie-breaking eighth-inning single by the Giants' David Bell. The Giants brought the Angels to the brink of elimination by winning Game five in a blowout. The Giants were eight outs away from winning the Series in Game six, but late game home runs by Scott Spiezio and Darin Erstad, as well as a two-RBI double by Troy Glaus helped the Angels overcome a five-run, seventh-inning deficit to win. A three-run double by Garret Anderson was the difference in the Angels' Game seven win to clinch the series. Glaus was named the series MVP. As of 2016, 2002 was the most recent Fall Classic appearance for the Angels. This was the fourth World Series played between two teams from California and the last World Series as of today involving two teams from the same state. The 1974 World Series saw the Oakland Athletics defeat the Los Angeles Dodgers; the 1988 series saw the Dodgers getting revenge by defeating the Athletics. In 1989 the San Francisco Giants were defeated by the Oakland Athletics. The managers of the two clubs, Mike Scioscia of the Angels and Dusty Baker of the Giants, were teammates on the Dodgers from 1980–1983, and won a World Series in 1981. This was the first World Series to feature opposing managers who had been teammates on a World Championship team as players. Since their 1958 move from New York to San Francisco, the Giants franchise and its fans had a long history of futility, frustration, and disappointment. The Giants had won their last World Series crown before the move, in 1954. Since the move, the Giants made it to the Series twice but lost both times. These included a dramatic, down-to-the-wire loss to the New York Yankees in the seven-game classic 1962 World Series, and a four-game sweep by their crosstown rival Oakland Athletics in the 1989 World Series that was marred by the Loma Prieta earthquake. Their most recent postseason appearance was in 2000, when they were defeated by the New York Mets in the NLDS. In addition, the Giants narrowly missed winning the N.L. pennant in 1959, 1964, 1965 and 1966. They finished in second place five years in a row from 1965–1969 and lost the 1971 NLCS to the Pittsburgh Pirates. 2002 was Dusty Baker's tenth season as manager of the Giants. It was also their third season playing at Pacific Bell Park (now AT&T Park). The Giants finished the previous season with a record of 90–72, finishing in second place in the NL West, two games behind the Arizona Diamondbacks. They also finished in second place in the NL wild card standings, three games behind the St. Louis Cardinals. Notable player departures included 2001 midseason acquisition Andrés Galarraga, who departed as a free agent, and Shawn Estes, who was traded to the New York Mets in exchange for Tsuyoshi Shinjo and Desi Relaford. Notable player acquisitions included Reggie Sanders, a free agent, and David Bell, who the Giants received from the Seattle Mariners in exchange for Desi Relaford and cash. During the season the Giants also acquired Kenny Lofton from the Chicago White Sox in exchange for two minor leaguers. Sanders, Bell, Shinjo, and Lofton helped bolster a Giants offense led by longtime Giants Barry Bonds, J. T. Snow, Rich Aurilia, and Jeff Kent, as well as relative newcomer Benito Santiago. The starting pitching rotation was led by Kirk Rueter and Jason Schmidt, with a bullpen led by Tim Worrell and closer Robb Nen. During the 2002 regular season, the Giants led the NL West standings for most of April and a few days in May; however, by the end of May they had fallen to third place behind the Los Angeles Dodgers and Arizona Diamondbacks. They spent most of the next three months in third place, but on September 9 they took second place for good, while the Dodgers either tied them or fell to third place for the rest of the season. The Giants finished the regular season with a record of 95–66, 2 1⁄2 games behind the NL West champion Diamondbacks. They won the NL wild card, 3 1⁄2 games ahead of the runner-up Dodgers. Dusty Baker became the first black manager to participate in a World Series since Cito Gaston for Toronto in 1992 and 1993. This was Giants' outfielder Reggie Sanders' second consecutive World Series appearance with different teams—in 2001 he got there with the Arizona Diamondbacks. This was the first time this happened since Don Baylor did it in three consecutive years with the Boston Red Sox in 1986, the Minnesota Twins in 1987, and with the Oakland Athletics in 1988. Like the Giants, the Angels and their fans carried a long history of futility and disappointment. Enfranchised in 1961, the Angels had never before played in the World Series. They came close several times, including ALCS losses in 1979 to the Baltimore Orioles, 1982 to the Milwaukee Brewers, and in 1986 to the Boston Red Sox. After dropping the 1979 ALCS in four games, the Angels brought their opponents to the brink of elimination in the last two series, but lost the next three consecutive games to lose the series. The 1986 ALCS was the Angels' last postseason appearance, though they came close in 1995 when they lost a one-game tie-breaker for the AL West championship to the Seattle Mariners after blowing a 14-game lead in the standings. 2002 was the Angels' third season under manager Mike Scioscia. The Angels finished the previous injury marred season with a record of 75–87, finishing in third place in the AL West. The most notable personnel change during the offseason was the trade of first baseman Mo Vaughn to the New York Mets in exchange for pitcher Kevin Appier. Offensively, the team was led by longtime Angels Garret Anderson, Darin Erstad, Troy Glaus and Tim Salmon, as well as relative newcomers Adam Kennedy and David Eckstein. The starting pitching rotation was led by Ramón Ortiz and Jarrod Washburn, as well as mid-season call-up John Lackey, while the bullpen was led by setup man Brendan Donnelly and closer Troy Percival. The bullpen was bolstered in late September by the addition of 20-year-old reliever prospect Francisco Rodriguez. The Angels spent much of the season trailing the first-place Seattle Mariners and on occasion the Oakland Athletics in the AL West standings. However, the A's and Angels both mounted late-season comebacks that, coupled with a poor August record for the Mariners, knocked the Mariners down to third place. The A's won 20 straight games at one point, and The Angels finished the season in second place with a 99–63 record, four games behind the A's, but won the AL wild card, six games ahead of the Boston Red Sox and Seattle Mariners. Their 99 wins was third best in the A.L. and fourth best in baseball. San Francisco won 4–3 at Edison International Field of Anaheim (now Angel Stadium of Anaheim) to take a 1–0 series lead. As he strode into the batter's box to open the second inning, Barry Bonds was finally making his first (and only) World Series appearance. And in his first at bat on a 2–1 pitch from Angels starter Jarrod Washburn, Bonds smoked a line drive for a home run to right field, which gave the Giants a quick 1–0 lead. Reggie Sanders then followed that up with an opposite field homer later in the inning. With the Giants leading 2–1 in the fifth, Giants batter J.T. Snow (who formerly played for the Angels) hit a two-run shot over the center field wall to give San Francisco a three-run advantage. Eventual Series MVP Troy Glaus would hit two home runs for the Angels in this game; one in the second and another in the sixth off Giants starter Jason Schmidt. Adam Kennedy drove in a run with a base hit in the sixth as well, to trim the deficit to 4–3. However, Schmidt was very effective otherwise, along with reliever Felix Rodriguez and closer Robb Nen as they held off the Halos the rest of the way. Game 2 was a slugfest that saw the lead fluctuate wildly between the two teams. The Angels plated five runs in the first inning by batting around against Giants starting pitcher Russ Ortiz. In the second inning, however, Kevin Appier surrendered most of the lead by allowing a three-run homer to Sanders and a solo shot to David Bell. The Angels answered with a two-run home run from veteran Tim Salmon to make it 7-4 in the Angels' favor. Ortiz would not finish the inning and was relieved by Chad Zerbe, who provided four innings of relief. Appier wouldn't last much longer than Ortiz, as he was pulled in the third and replaced by John Lackey, the Angels scheduled starter for Game 4, after surrendering a lead-off home run to Kent. Lackey temporarily quieted the Giants' offense but ran into trouble in the fifth inning, loading the bases with one out. Ben Weber relieved him but proceeded to allow a two-run single to Snow that tied the game. San Francisco plated two more to take a 9-7 lead. The Angels turned to 20-year-old rookie reliever Francisco Rodriguez, who answered by shutting down the Giants offense for the next three innings. He retired nine batters in a row on 25 pitches (22 were strikes). Meanwhile, the Angels chipped away at their deficit and eventually tied the game on an RBI single by Garrett Anderson. The Angels completed their comeback when Salmon drilled a two-run home run with two outs in the eighth inning, giving Anaheim an 11-9 lead. Closer Troy Percival retired the first two batters in the ninth, but allowed a mammoth shot from Bonds that landed halfway up the right field bleachers. It was only a solo shot with a two-run lead, and Percival retired Benito Santiago to even the series. Giants pitchers failed to strike out a batter for the entire game, the first time this had happened in the World Series since Game 7 of the 1960 World Series; as of 2014 it remains the last time a team has not recorded a strikeout in a World Series game. Anaheim won 10–4 in the first World Series game at Pacific Bell Park (now AT&T Park). The Angels batted around twice without a home run in either of their four-run innings. They became the first team in World Series history to bat around in consecutive innings. Barry Bonds hit another home run, becoming the first player to homer in his first three World Series games. Giants public address announcer Renel Brooks-Moon is recognized by the Baseball Hall of Fame as the first female announcer of a championship game in any professional sport for her role in the 2002 World Series. Her scorecard from Game 3 is on display in the National Baseball Hall of Fame and Museum in Cooperstown, New York. Until 2014, this game was the Giants' only World Series loss at home since Pacific Bell Park opened in 2000. They proceeded to win the final two games in this series, then won four straight home games in their next two World Series appearances in 2010 and 2012 until finally losing at home in Game 3 in 2014. San Francisco scored a 4–3 victory to tie the series. NLCS MVP Benito Santiago tied the game with a single in the fifth inning after the Angels walked Barry Bonds with a runner on second and two outs. David Bell put the Giants ahead with an RBI single in the bottom of the eighth. The run was unearned, due to Anaheim catcher Bengie Molina's passed ball during the previous at-bat, allowing J.T. Snow to move to second. San Francisco took a 16–4 blowout win in a game in which the Angels never led. The most well-known moment in this game occurred in the bottom of the seventh when Giants first baseman J.T. Snow scored off a Kenny Lofton triple. Three-year-old batboy Darren Baker, son of Giants manager Dusty Baker, ran to home plate to collect Lofton's bat before the play was completed and was quickly lifted by the jacket by Snow with one hand as he crossed the plate, with David Bell close on his heels. Had Snow not acted quickly, Darren could have been seriously injured in a play at home plate. Giants' second-baseman Jeff Kent broke out of a slump by hitting two home runs, including a demoralizing blast in the sixth inning to give the Giants an 8-4 lead when it appeared the Angels were making a comeback. The turning point in the Series came in Game 6. Leading 5–0 with one out in the bottom of the seventh inning, eight outs away from the Giants' first World Series title since moving to San Francisco in 1958, Giants manager Dusty Baker pulled starting pitcher Russ Ortiz for setup man Félix Rodríguez after Ortiz gave up consecutive singles to third baseman Troy Glaus and designated hitter Brad Fullmer. In a widely publicized move, Baker gave Ortiz the game ball as he sent him back to the dugout. During the pitching change the Rally Monkey came on the JumboTron, sending 45,037 Angels fans into a frenzy. However, before the Angels' big rally, after being held scoreless for four innings, San Francisco took the lead in the fifth inning and added to their lead in the sixth behind a monster shot by Barry Bonds off Angels reliever Francisco Rodríguez, then added yet another run in the top of the seventh to increase their lead to 5-0. Then in the bottom of the seventh inning, Anaheim started their comeback. Angels first baseman Scott Spiezio came to the plate and fouled off pitch after pitch before finally hitting a three-run home run that barely cleared the wall in right field. The rally continued in the eighth inning, as Angels center fielder Darin Erstad hit a leadoff line-drive home run, followed by consecutive singles by Tim Salmon and Garret Anderson. (Chone Figgins pinch-ran for Salmon.) When Bonds misplayed Anderson's shallow left field bloop single, Figgins and Anderson took third and second base, respectively. With no outs, two runners in scoring position and now only a 5–4 lead, Baker brought in closer Robb Nen to pitch to Glaus, hoping that Nen could induce a strikeout that might yet preserve the Giants' slim lead. However, Glaus slugged a double to the left-center field gap over Bonds' head to drive in the tying and go-ahead runs. In the ninth inning, Angels closer Troy Percival struck out Rich Aurilia to preserve the 6–5 victory in front of the jubilant home crowd. The comeback from a five-run deficit was the largest in World Series history for an elimination game. Game 7 proved to be somewhat anticlimactic after the drama of Game 6. The Giants scored the first run on a sacrifice fly, but the Angels responded with a run-scoring double from catcher Bengie Molina and a three-run double to right field from left fielder Garret Anderson to open a 4–1 lead. Rookie starting pitcher John Lackey maintained that lead through five innings, and turned the game over to the strong Angels bullpen. In the ninth inning, closer Troy Percival provided some tense moments as he opened the inning by putting two Giants players on base, with only one out. But Tsuyoshi Shinjo—the first Japanese-born player in a World Series game—struck out swinging, and Kenny Lofton, also representing the tying run, flied out to Darin Erstad in right-center field to end the Series. The Angels won Game 7, 4–1, to claim their franchise's first and only World Series championship to date. John Lackey became the first rookie pitcher to win a World Series Game 7 since 1909. In Game 7, three rookie pitchers (John Lackey, Brendan Donnelly, and Francisco Rodríguez) combined to throw eight innings while only giving up one run combined. The Angels won the World Series despite scoring fewer runs (41) than the Giants (44). The Angels lost the first game in all three rounds of the playoffs (Division Series, League Championship Series, and World Series), yet rebounded to win each time. They were the first, and to date only, team to do this since the new postseason format was created in 1994. The Angels became the first American League (AL) champion team not representing the AL East Division to win the World Series since the Minnesota Twins in 1991. The Angels were also the first American League Wild Card winner to win the World Series. 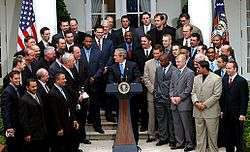 Victorious Angels players being honored at the White House Rose Garden by President George W. Bush. The 2002 World Series win began the most successful era in Angels franchise history, making six postseason appearances from 2002–2009. Before 2002 they had been to the postseason three times in franchise history. They advanced to the ALCS in 2005 and 2009, but lost those series respectively to the Chicago White Sox and New York Yankees, each while en route to their own World Series championship. The Angels are the most recent team to win the championship in its first World Series appearance; all teams that have reached their first World Series since have lost—the Houston Astros in 2005, Colorado Rockies in 2007, Tampa Bay Rays in 2008, and Texas Rangers in 2010). The Giants would return to the postseason the following season, but lost the NLDS to the Florida Marlins while they were en route to a World Series championship. After a second-place finish in 2004, the Giants had losing seasons for the next four years. After losing 90 games in 2008, the Giants won 88 games for a surprising third-place finish in 2009. Building on their 2009 season, the Giants made the playoffs again in 2010, defeating the Braves in the NLDS, and the Phillies in the NLCS en route to the World Series, where they defeated the Rangers in five games, earning the long-awaited championship they could not reach in 2002. In 2012, after fighting back from down two games to none in the NLDS against the Cincinnati Reds and down three games to one against the defending World Series Champions, the St. Louis Cardinals in the NLCS, they swept the Detroit Tigers for their second World Series Championship in three years. In 2014, the Giants added their third title in five seasons by defeating the Kansas City Royals. This was the last World Series where home-field advantage alternated between the National and American Leagues each year. As a result of the tie in the 2002 All-Star Game, beginning in 2003 home-field advantage in the World Series was controversially granted to the league that won the All-Star Game. Fox's telecast of this World Series marked the first time the World Series was telecast in high-definition. Jon Miller, who called this World Series for ESPN Radio, has been play-by-play man for the San Francisco Giants since 1997. Coincidentally, KNBR, the Giants' longtime flagship station, was also San Francisco's ESPN Radio affiliate. This would be the only World Series called by Angels play-by-play man Rory Markas, who died of a heart attack in January 2010. ↑ "2002 World Series". Baseball-Reference. Retrieved January 6, 2014. ↑ "2002 World Series Game 1 - San Francisco Giants vs. Anaheim Angels". Retrosheet. Retrieved September 13, 2009. ↑ "2002 World Series Game 2 - San Francisco Giants vs. Anaheim Angels". Retrosheet. Retrieved September 13, 2009. ↑ "2002 World Series Game 3 - Anaheim Angels vs. San Francisco Giants". Retrosheet. Retrieved September 13, 2009. ↑ "2002 World Series Game 4 - Anaheim Angels vs. San Francisco Giants". Retrosheet. Retrieved September 13, 2009. ↑ "2002 World Series Game 5 - Anaheim Angels vs. San Francisco Giants". Retrosheet. Retrieved September 13, 2009. ↑ "2002 World Series Game 6 - San Francisco Giants vs. Anaheim Angels". Retrosheet. Retrieved September 13, 2009. ↑ "2002 World Series Game 7 - San Francisco Giants vs. Anaheim Angels". Retrosheet. Retrieved September 13, 2009. Forman, Sean L. "2002 World Series". Baseball-Reference.com - Major League Statistics and Information. Archived from the original on December 17, 2007. Retrieved December 9, 2007. Gavant, David (Prod. ); Chaplin, Curt (Narrator) (September 26, 2002). 2002 World Series (Documentary / DVD). Anaheim, California: MLB Productions / WEA. Retrieved September 21, 2008. History of the World Series - 2002 at The SportingNews. Archived from the original on 2008.